Netflix has released the first look photos from the Chilling Adventures of Sabrina‘s upcoming special Christmas episode titled “A Midwinter’s Tale.” Check out the photos below! 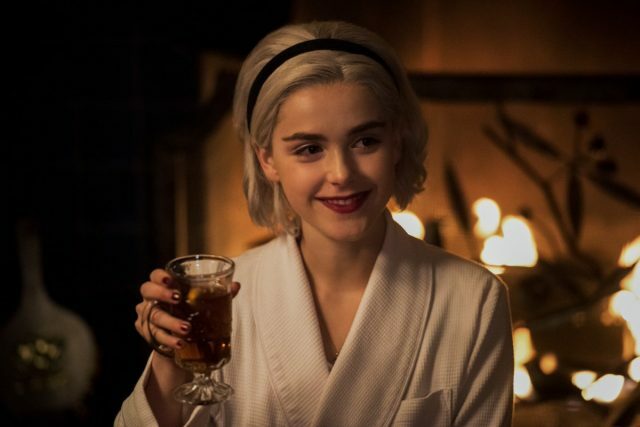 Chilling Adventures of Sabrina: A Midwinter’s Tale will premiere on the streaming service on December 14. The episode will focus on Church of Night’s annual celebration of the Winter Solstice, which could prompt an unexpected visitor coming in by way of their chimney. Roberto Aguirre-Sacasa (Riverdale) is writing the adaptation (the comic book basis for which he also wrote) and will executive produce. Lee Toland Krieger will direct and executive produce with Aguirre-Sacasa, Greg Berlanti, Sarah Schechter, and Jon Goldwater. The drama hails from the Warner Bros. Television-based Berlanti Productions. The post Chilling Adventures of Sabrina: Photos Released For Christmas Episode appeared first on ComingSoon.net.